Brendan Hyland competing for Ireland in the Men’s Medley 4x100 relay. Swimming is predominantly a minority sport in Ireland, sitting on the bench alongside so many others while the GAA, soccer and rugby take up the starting spots of participation and media coverage. Although that hasn’t relegated it to mediocrity, with several Irish swimmers performing admirably at the FINA World Swimming Championships in December last year, and even managing to bring home a bronze medal in the 50-metre backstroke through Shane Ryan. However perhaps even more notable than that has been the recent form of Brendan Hyland. The 24-year-old DCU Accounting and Finance student had a remarkable year in 2018, which culminated with the breaking of two Irish national records in as many days at the very same competition. 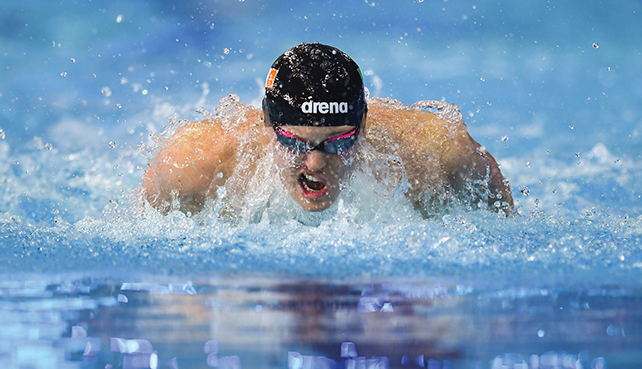 First came the 200-metre fly, where he knocked a monstrous three seconds off of the previous record, registering a time of 1:53:19 as he finished 10th overall in the event. The following day was the turn of the 100-metre fly sprint where Hyland produced a time of 51:54, chipping .66 of a second off of the former 52.20 Irish record set by Conor Brines only two years ago. Huge Irish Senior Record for @brenhyland94 1.53.19 in the men’s 200fly, taking over 3 seconds off the previous record. 10th overall ??? The DCU Scholarship Athlete had his first outing of 2019 in the Flanders Swim Cup in Belgium, which took place on January 19th and 20th and the Tallaght swimmer showed no signs of slowing down. He flew home carrying two medals in his luggage, a bronze in the 200-metre butterfly and silver in the 100-metre butterfly, as the Irish team once more showed promise with both Darragh Greene and again Shane Ryan registering impressive performances. Hyland’s next competitive outing will be at the Dave McCullough meet in February. He appears to be have timed his rising tide perfectly with the National Championships due to take place in March, which will be central to his efforts for qualification to the next World Aquatics Championships set to be held in Gwangju, South Korea, in July of this year. Speaking to The Echo, Hyland alluded to the challenges both he and the Irish team will face at that competition. “We’ll be looking at the world championships and trying to finish in the top 12. “The relay is so competitive in this, probably even more than the Olympics, because you have the top eight to 20 teams all believing that they can finish in the top 12,” Hyland said. The 2020 Tokyo Olympics will presumably be in the back of his mind, as the Olympics tend to be for all elite athletes, and his results to date will surely give him cause for confidence. However, he hasn’t lost sight of the task at hand. “I can’t guess where I’ll be at come the World Championships this year, but anything is possible, that’s the mentality I have,” Hyland told the Echo.